I love to drop shot but I don’t love line twist, and that’s one of the biggest problems with drop shotting. That’s too bad because on tough days a drop shot is one of the most effective ways to put one in your livewell. With that in mind, I set out to solve that problem. That shouldn’t come as any surprise to those of you who know me or who have followed my career. I tinker with everything and, thanks to some first-class professional sponsors, some of my modifications actually make it to fruition. The VMC Spinshot Hooks are in that group. There are three basic designs with these hooks. We have a Wide Gap, a Power Shot and a standard Drop Shot. 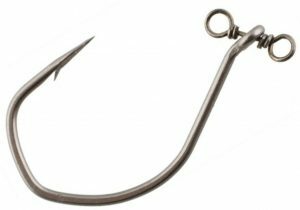 hook makes sure your bait won’t get balled up inside the bend when the fish takes it, and the 3 degree offset hook point makes sure you get a good, clean penetration when you set the hook. 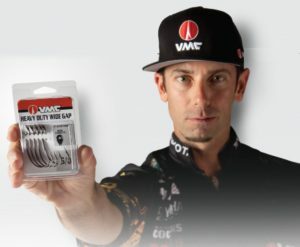 The Power Point has a wide enough gap to use with big baits and it’s strong enough for heavy tackle and giant bass as well as nasty cover. And, like the Wide Gap it has a 3 degree offset at the point. The standard Drop Shot is your basic hook for everyday drop shotting, but don’t confuse basic with ordinary or routine. 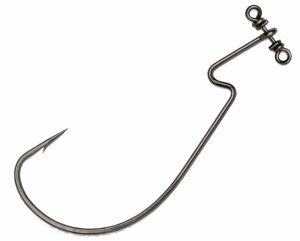 This hook has a series of unique bends that minimizes snags but at the same time makes hooksets easy and efficient. 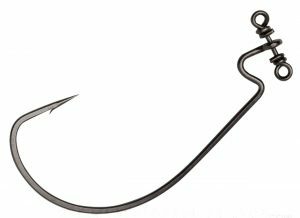 In fact, this hook is so unique that it was named Best of Show in Terminal Tackle at the 2011 ICAST Show, the biggest and most complete fishing tackle trade show in the nation. The other thing that happens when you’re fishing with it is that your lure will spin and dance all during your retrieve, and when you’re holding everything perfectly still it’ll move back and forth naturally with the movement of the swivel. These hooks are for real, guys. Give them a try this year and watch your bass fishing improve every single time you rig a drop shot. Want to learn more about drop shotting? Subscribers, login and type “dropshot” into the search box to bring up the full videos.